BLACK KNIGHT: Vintage 60's Skateboard for Collectors. 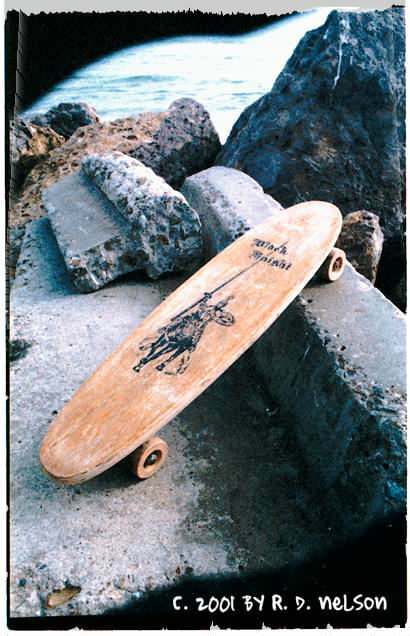 The vintage "Black Knight" skateboard featured here was a 60's production item, with featured Black Knight graphics upon its multi-layered laminated wood deck with clay type wheels. The Black Knight Logo is in fairly good shape. Please click photo above to view the full size scan of the board to see the top deck accurately. The finish appears to be bare wood on the underneath, with Protective varnish on top which is weathered or worn thin to almost bare wood in some places. The board itself is structurally sound. A small crack is visible on the bottom wood layer upon close inspection, but it does not go beyond that layer. 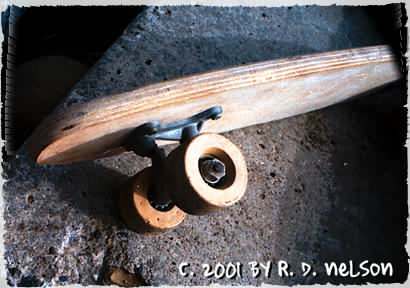 The trucks are in good condition, as are the rubber bushings, and all bearings are present and wheels spin fine. A small amount of rust is on the surface of Main Truck bolts. This board has not been restored. If you ever ridden a clay-wheeled stead like this, you will realize this classic is READY (not for rocks), but to ROLL! This Black Knight skateboard rode off into the sunset in 2001. It was purchaced for the collection of a life long skater, as a replacment for the board he rode as a child. All photos © 2001 by R. D. Nelson. All rights reserved.